Do You Really Need a Custom Web Design? You'd probably be surprised that even we don't necessarily think that a personalized website design is the right fit for everyone. If you don't have a lot of money to spend and don't mind that you will have an overused and generic look that you've seen dozens of times, then a template might be a better option for you. 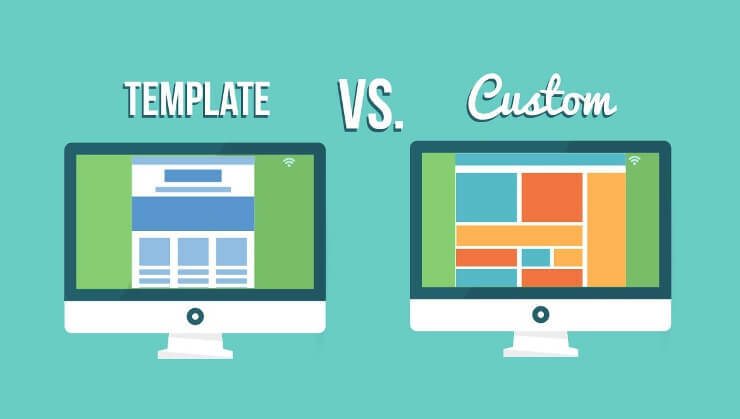 There's absolutely nothing wrong with using a template, as it can be more suitable, depending on the project's needs and budget. However, it's important to know that it comes with major drawbacks. Now let's say you have a cool and unique idea for a website. You could absolutely just use a template and have a site with a generic look and feel. But you probably don't want to do that, as your users will feel like you're a company that can't afford to stand out. With a custom website design, you are able to establish your own unique user experience that essentially defines you as a company. Examples of these include iOS, Android (Material), Microsoft, Facebook. Any user of these can instantly recall the look and feel associated with them. This helps create outstanding brand affiliation. For instance, if you have an e-commerce website that sells organic products, you may want an "earthy" and clean feel to it. Let's say we just created a blog for you, but now you need to add more posts. You most likely don't want to mess around with any code. Here's where WordPress comes into play. WordPress is the most popular popular Content Management System (CMS). WordPress is not the only good CMS, as there are plenty of other great ones, like Joomla, Drupal and Django. Additionally, we can create custom content management systems for you too. For instance, you might want to have the ability to block users and ip addresses on your site; maybe you want to track orders for your shopping cart. Whatever the case, we can easily set up a user-friendly control panel for you to be able to do whatever you want. Uber, Snapchat, WhatsApp and so many other mobile apps have had outrageous success, due to the booming industry. In a lot of ways, apps are just tiny websites with limited functionality. However, this is perfect for mobile usage, due to tiny phone/tablet screens, along with users who are typically on-the-go. iPhone and Android apps have the unique advantage of being submitted to the App Store and Google Play, which makes it easier to find your application than if it were a website. SEO has become vital to the success of most online marketing campaigns nowadays. The reasoning behind this is fairly intuitive: if you were to look for a service — let's say custom website designers in Boca Raton — what would you do? You would probably Google that and click on one of the top results on the first page. This makes sense, as a study has shown that the first result accounts for approximately a third of the clicks, the top three results receive about 60% of the traffic and the first page gets a little more than 90% of the clicks. Based in sunny Boca Raton, Florida, Website Beaver is a web development firm that caters to all areas worldwide.